The additional cost of buying premium gasoline instead of regular has doubled since 2010. At a Shell station in Tucson, Ariz., regular gasoline cost $1.17 a gallon earlier this month, according to GasBuddy.com, while premium was $1.75. That's nearly 50 percent more. In Chicago, a Pilot station had regular for $1.95 and premium for $3.09, 58 percent more. And an Exxon station in Newport News, Va., offered regular for $1.59 and premium for $2.89 -- 82 percent more. Five years ago, premium cost an average of 7 percent more than regular, government data show. At current prices, buying premium would cost an average driver several hundred dollars more this year, and potentially several thousand over the life of a vehicle. The sudden shift has effectively wiped out the fuel-economy advantage claimed by some models with turbocharged engines that demand premium, and it's undoubtedly making some drivers rethink whether the added cost is worth it. The price difference might not matter much to those who can afford luxury and high-end performance cars, which typically require premium. But it can be painful for owners of cheaper cars that demand higher octane, including the Mini Cooper and Smart ForTwo, and confusing for drivers of vehicles that recommend premium who fear damaging the engine or voiding the warranty by using regular instead. Nissan North America recommends drivers put premium in its Maxima and Juke. Company officials say it's fine to ignore that suggestion, and they acknowledge that more drivers are likely doing just that now that the savings are so substantial. "We recommend premium fuel, but customers can feel free to use regular," said Tiago Castro, senior manager of product planning for Nissan North America. "At some point, they may not see the value in premium. We make it clear it's recommended, not required." 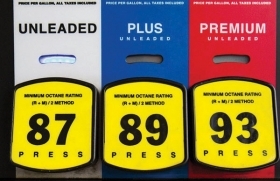 Fuel octane requirements are likely not among the specs that most people study when shopping for a new vehicle, yet they'll be faced with the decision of which grade to buy every time they stop to fill up. "If it says "premium recommended,' then you don't have to -- why spend the extra money?" said Carroll Lachnit, a consumer advice editor at Edmunds.com. "But you're not going to save that much money, so if you've spent the money on a sports car or a luxury car, don't cheap out now." In the 1990s and 2000s, a gallon of premium consistently cost about 18 to 20 cents extra, according to the U.S. Energy Information Administration. When gasoline prices surged in 2008, the disparity grew a few cents wider, but drivers were still paying less than 10 percent more for the higher octane. Now, premium costs an average of 48 cents more a gallon than regular. Percentagewise, the gap between the two grades has tripled since 2013 and more than doubled just since August. Even before premium became so much more costly, General Motors heard complaints from many owners of the first-generation Chevrolet Volt, which required premium for its 1.4-liter range-extending engine. For the redesigned Volt, which went on sale last fall with a new 1.5-liter engine, GM says drivers can use regular. "Feedback from Gen 1 owners definitely played a role," GM spokesman Kevin Kelly wrote in an email. "That was one of the key things that people wanted to see changed." Ford Motor Co. recommends premium for the 2016 Escape with a twin-scroll EcoBoost engine, the Flex with EcoBoost and most Mustang variants. But spokesman Paul Seredynski said none of the company's vehicles requires premium for everyday driving. "EcoBoost engines don't require premium fuel," Seredynski said. "Ford recommends that you don't go below 87, but all modern engines simply adapt to whatever fuel you put in." The U.S. EPA doesn't test vehicles with multiple grades of gasoline, but its guidelines say lower-octane fuel shouldn't significantly reduce fuel efficiency. Ford's specifications for the 2016 Fusion say the 2.0-liter engine will produce 231 hp with regular and 240 hp with premium, a 4 percent increase. They say regular is recommended. Daimler AG's Smart brand, in a guide to maximizing fuel economy it published, says the ForTwo gets 3 mpg better using premium than regular. The 2016 ForTwo's owner's manual cautions that using less than 91 octane fuel "can lead to engine failure." Ahmad Bachan, the Smart brand manager at Loeber Motors in Lincolnwood, Ill., said customers don't seem to mind using premium and that the risks created by trying to save a few dollars are too great. "You still can use regular," Bachan said, "but it doesn't give you the same quality, it doesn't give you the same mileage, and in the long term it will ruin the engine." For most vehicles, though, premium recommendations are more marketing than warning. "I actually drive a Maxima every day, and I use regular," said Nissan's Castro. "It doesn't make enough difference for me to say, "Wow, I need that extra performance.'"